It has just come to my attention that rotisserie chicken sold under the Kirkland brand at Costco stores nationwide, and traced to three Foster Farms plants in California, is subject to a major recall after over 300 people nationwide were sickened with an antibiotic-resistant strain of salmonella (1,2,3). Foster Farms brand chickens grown in Washington are sold at many local stores including Bigfork’s Harvest Foods, but are not involved in the recall. Are these fresh chicken products risky? How do chickens become infected with salmonella? While Costco traces this particular problem to “cross-contamination after the [rotisserie] cooking process [to 180°F] in the preparation area,” the source of the problem likely can be traced back to how the chickens were grown. Confinement Animal Feeding Operations (CAFOs) are the farm model of choice for commercial meats. 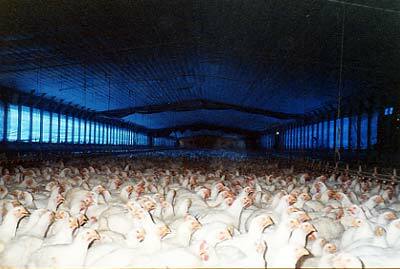 Chickens are housed in industrial-size warehouses with little room to move, as in the photo, right, from FactoryFarming.com (5). The birds are bred to boast excessively large breasts with tiny legs not strong enough to support the rest of the body, so many of the poor birds lie in their own filth, exposing them to pathogenic bugs like salmonella. 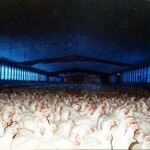 Want to know where CAFO chickens are raised? Check out the Factory Farm Map (7). Just to the left of the map you can select which type of livestock you want displayed. “Broilers” are the primary type of chicken in grocery stores; “layers” are hens raised for egg production. You can also view other livestock including Cattle, Dairy, and Hogs; or you can check “All”. You can also click on a particular state to see the data by county boundary. The most current date for the map is 2007; you can be sure there are even more CAFOs now. Look for cuts, holes or rough patches, especially on the legs but also on the breasts; these indicate ammonia burns. The cuts/holes are where a burn was cut out. If the brand is Tyson or Cargill, you can be sure it is CAFO, and now, too Foster Farms has been exposed as a CAFO brand. I’ve often wondered about the chickens from local Hutterite colonies, as they are always wrapped with an opaque wrapping so that you cannot investigate the skin. But if you buy one, carefully examine the skin as you prepare it for cooking. Pay special attention to the legs, as this is where the burns are most likely. I don’t usually find any on the Hutterite chickens I’ve bought, but I have found them on occasion. The best answer is “from your local family farm.” And to find these here in the Flathead, go to the Farmhands Map (8). You can still find ‘eggs’ on the map, but ‘chicken’ or ‘poultry’ is no longer an available icon (as of this writing). Also, ask around, as lots of non-CAFO farmers choose not to be displayed on the map. Another option is to buy Certified Organic chicken, as these cannot be raised in a CAFO and still carry the Organic label. When you eat out, be sure to ask about the source of the chicken on the the menu. This entry was posted on Saturday, October 19th, 2013 at 12:07 pm and is filed under Agriculture, Ecology, Food-Nutrition-Health, Health. You can follow any responses to this entry through the RSS 2.0 feed. Both comments and pings are currently closed.